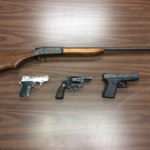 Kalamazoo, MI: On 7/12/16, investigators from the Kalamazoo Valley Enforcement Team, along with officers from the KDPS Operations Division, conducted an operation in the 1300 block of Alamo Hills Drive in reference to a recent spike in robberies and gun violence. KVET investigators received information from concerned citizens that the group of subjects responsible for the robberies were hiding out on Alamo Hills Drive. KVET investigators conducted surveillance of the subjects and were able to identify them as suspects wanted on outstanding felony warrants for armed robbery. KVET investigators and KDPS officers secured the location and called for the suspects to surrender. All occupants of the residence exited and surrendered without incident. 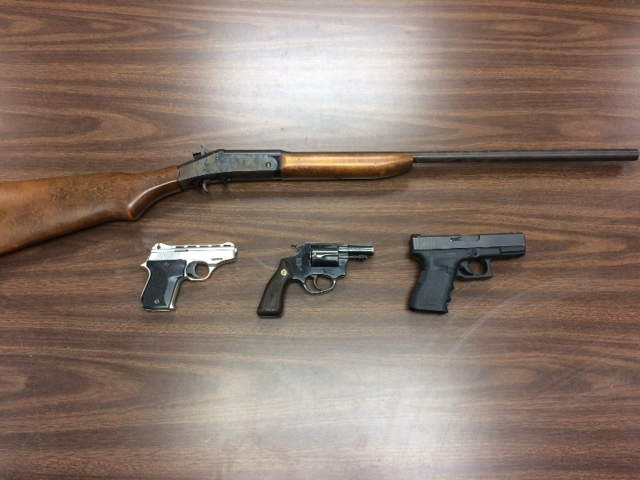 During a search of the residence, officers located three handguns, a shotgun, and evidence of recent robberies. Three Kalamazoo males were arrested and lodged at the Kalamazoo County Jail. A 19 year old male was arrested for a Felony Armed Robbery warrant. An 18 year old male was arrested for a Felony Armed Robbery warrant and a Felony Probation Violation warrant. A 17 year old male was arrested for Felony Probation Violation. Several additional felony charges will be forwarded to the Kalamazoo County Prosecutors Office for authorization in the near future. KVET would like to thank the Citizens of Kalamazoo for the tips and assistance with capturing these violent offenders.